For customers interested in establishing and maintaining their own cloud environment, Cadence offers the Cadence® Cloud Passport model. With the Cloud Passport, customers gain the contractual ability to place Cadence software in their own public cloud environment. Customers maintain ownership of their public cloud relationships and serve as the only point of contact with the public cloud vendor they have chosen to deploy within their company. Using this model, customer CAD and IT teams are solely responsible for the setup, maintenance, and support of their own public cloud environment. Current customers have used this model with several different public cloud vendors, including Amazon Web Services (AWS), Microsoft Azure, and Google Cloud Platform. Cloud-ready tools include the Cadence software that has been qualified to run as expected on a compute cluster provisioned on the public cloud. The initial qualification process has focused on products that natively benefit from the massive scalability of the cloud. Current Cadence products that are cloud ready include tools for circuit simulation, power and EM analysis, logic simulation, formal verification, physical verification, timing signoff, extraction, power integrity, and library characterization. Additional tools will become available based on customer need. The Cloud Passport is suited for companies who have the means and expertise to manage their own cloud infrastructure internally. 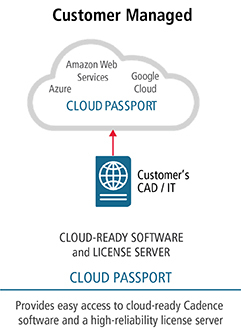 Additionally, the Cloud Passport can be combined with any other Cadence Cloud offering, so customers can subscribe both to the Cloud Passport model to run cloud-ready tools within their own public cloud environment and leverage the Cadence-managed Cloud-Hosted Design Solution or Palladium® Cloud solutions for specific peak or project needs.